The bulk of fall seeds are finally underway. Weather for the last week and a half has made a world of difference on the ability of things to germinate. With the full moon approaching, many of our last plantings of seeds were up and looking for light in less than 48 hours. Big thanks to everyone who signed up for the 8/28 dinner! We love having everyone get together. If you missed out this time that’s fine, sign up next week for the 9/25 cooking class and dinner. Remember, you can pick your share up at the dinner and not have to make two trips. Mark your calendar! If you or someone you know would like to support and help ensure continuance of the farm program, see a segment of our press release below. 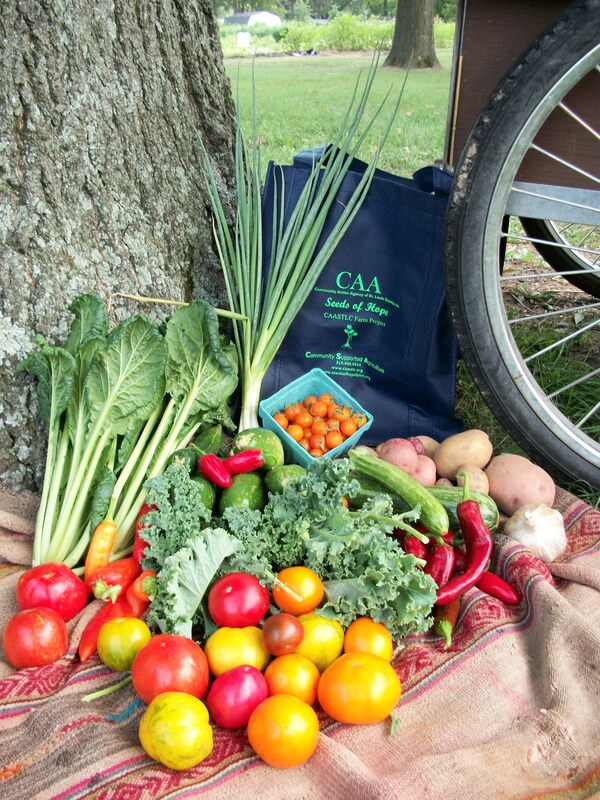 Proceeds from the event will go toward our farm, garden, and food pantry programs. This will be a fun and eventful night. Your share includes a large number of hot peppers this week. They are in the bag with the cucumber and zucchini. Great for salsa, stir fries, or a little zing in anything, a few hot peppers go a long way. So, here is a drying tip from drycreekgarden.com to help them last. …Another way to dry your peppers is to remove the peppers from the plants at harvest time. Leave the fresh peppers whole and be sure to include the stem when you pick them (shred the plants and add the greens to your compost pile). Use a strong needle and thread to loosely sew the stems together. Be sure to leave enough space between each pepper pod to ensure proper air circulation. Hang the clusters up to dry, preferably in a cool, dark place, but many people choose to hang their pepper clusters in places where they can be seen and enjoyed while they dry, like in the kitchen. Hot peppers can also follow the ‘refrigerator pickle’ method as a way of storing them as well. Maybe drop a couple jalapenos in the bottom of some leftover pickles and enjoy them spicy as well. What’s that dark green leafy rosette in the bag? Tatsoi, an asian green rarely available in summer. Tatsoi is more of a cool weather crop, but we tried growing it under some shady oak trees and it turned out. It is the first Asian vegetable we are offering and there are more on the way as we head into fall. Tatsoi is quite tender and mild. It’s great in soups (hot or cold), stir fries, in salads torn small, or even torn small and placed on a sandwich, like we did today on the farm. Some of it fell off of my sandwich and into some rosemary smashed potatoes..I tried it and was grateful it placed itself there. Use with little caution, it’s delicious. With the heat sticking around, we’ll get some cold soup recipes your way in the next few weeks. Thanks to Leslie Bertsch of Operation Food Search for this recipe we will use at tonight’s CSA dinner. She has been a great collaborator, guiding us through our monthly dinners and teaching practical skills like healthy meal planning and food preparation. The meals we make together are simple and satisfying, and always delicious! Please click on the link to learn more about how Operation Food Search makes such a difference in the community, and shares our goal of improving food security and nutritional awareness among underprivileged St. Louisans. In a non-stick pan, heat oil over medium-high heat. Add bell peppers and potato and sauté until soft. Add kale and cook until kale is wilted and just soft. Add in black beans, salt and spices. Stir to combine. Remove from the heat. Smash beans lightly with a fork. Add in 1-2 tsp of water to make a bean and veggie paste. Lay a tortilla in the pan, spread the bean and veggie mixture over half of the tortilla. Sprinkle cheese on top. Fold in half and cook over medium heat for 2 minutes on each side or until cheese melts and tortilla is slightly golden. Cut tortillas into wedges (like pizza) and serve.